To wrap up the guest makeovers today, I'm welcoming back Jessica. She is the author of the always inspiring Lavender and Lilies - one of my favorite spots for a daily shot of pretty. While not quite as dramatic as the other makeovers of the week, this one is for all of you fabulously organized people (so not me but I really try!). Simple and smart and less than $100! Can't beat it.  Thanks so much to Stefanie for having me as a guest on her blog again. Stefanie is my blogging icon so I am always happy to visit. For those of you that do not read my blog, Lavender and Lilies, my husband and I have spent the last two years renovating our 1930s bungalow in South Carolina. Our bungalow has a small laundry “closet” of sorts right outside of the master bedroom. When we moved in there was nothing in the space. To get by we installed some horrible wire shelving over our washer and dryer, which I hated. Individual bottles always fell over and it looked disorganized and just a mess. We decided to tackle the space and make it more organized but we didn’t want to spend more than $100 or so. Off we went to Lowe’s where we found a prefab cabinet that included a small rod for hangers. My husband ripped out our shelving, patched the holes in the walls and installed the new cabinet in under an hour and a half. We were able to stash all of our laundry goodies, pet supplies and other various and sundry items in the cabinets and still have the small rod to hang clothes. I also found the adorable “Dry Cleaning” tote at Pottery Barn Kids. It is meant to be a floor tote for children’s toys but I ordered the Chocolate Polka Dot tote and had it personalized with “Dry Cleaning”. It is so convenient to just grab the tote when I need to run to the dry cleaners in the morning. 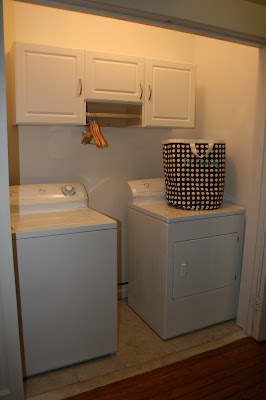 That was our simple laundry room re-do. Thanks again to Stefanie for having me! Looks amazing! I was so struck by the picture because our laundry nook looks almost exactly the same as your "before" picture, and we've been looking for some great shelves. Do you happen to know the item number or description? Thanks! Ooh it looks so nice and organized! Great job! doesn' t it feel great to have it organized? I need to organize my laundry room! Yours looks great! I have those wire shelves too, ugh. I love your idea of the small cabinets instead of the shelves. 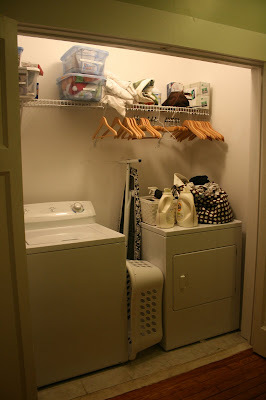 I have a very similar laundry closet that I would love to do something with. Actually, I would be happy if mine looked as organized as your before picture! The cabinets look great-- and I love the idea of having a dedicated hamper for items bound for the dry cleaners. I may have to steal that idea! we too had wire shelves in both of our last homes and ripped them out ASAP. :) laundry detergents (like childrens toys) are bright-colored PLASTIC bottles and all the colors of cleaning products only ADD to the messiness of it all. Looks great! Anything that can make doing laundry better...I'm all for it! Huge improvement! Beautiful laundry closet. This simple re-do is a hit! It looks so much more functional and the changes seem so easy! Not surprised, everything about Jessica seems down to earth and straightforward. Glad you featured her!